First off, I need to mention that the J.Girdwood website is finally up and active. Anyone that has been into the first or second pop-ups will have seen James (above) and his J.Girdwood range of products. They include some Permanent Style favourites such as Bresciani socks, Merola gloves, Maglia umbrellas and so on. James has got his shop site live, at www.jgirdwood.com, yesterday. More details on his aims for it in a week or two. The Rake’s online shop has grown so much in the past year that it’s been hard to squeeze things into their pop-up space. Even though they’re focusing on exclusives. The good thing about this range is there’s something for everyone. So even if Sciamat jackets (above) are too eccentric, there is the quiet precision of 100 Hands shirts instead. And there are so many brands that, were it not for The Rake and the pop-up, you wouldn’t see anywhere in London. There’s Sciamat, Norman Vilalta, Chapal, Marol, 100 Hands, Francesco Marino and many more. 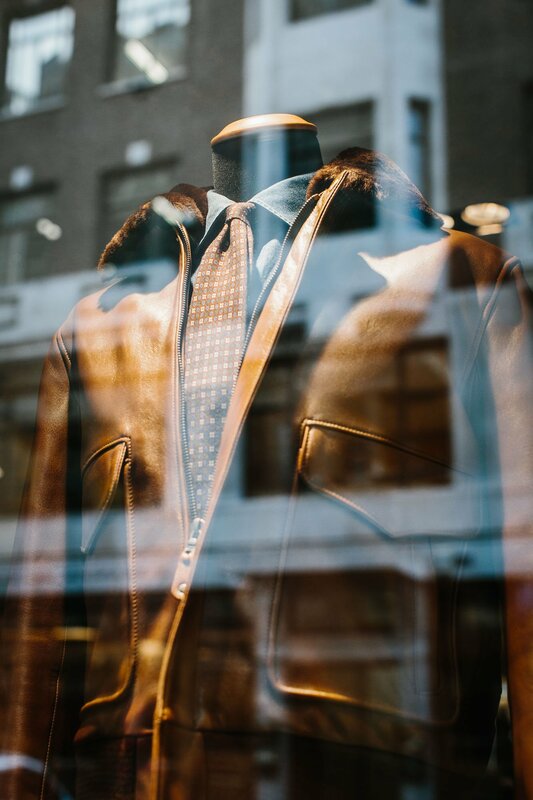 Personally, I’m really proud to have the Chapal aviator jacket on display in the window (£2735). I wrote two years ago about having my own made to order in Paris, and I know several readers that have travelled to France just to see and try it in person. Now you can in the pop-up. 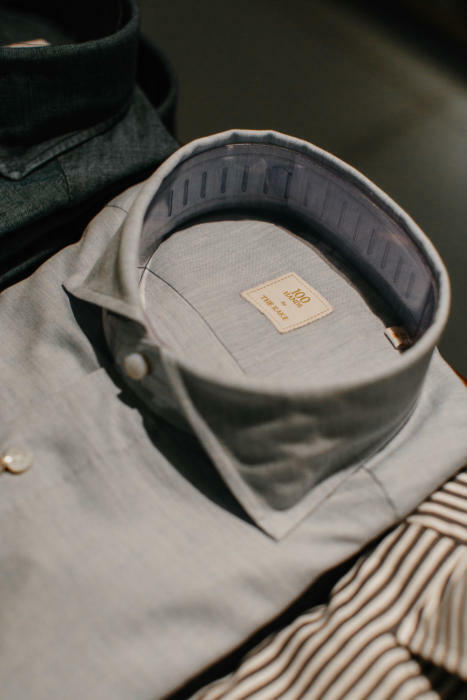 And 100 Hands (above, £300-£400) make simply the best hand-finished shirts anywhere - with all their tiny, precise hand-rolled hems. 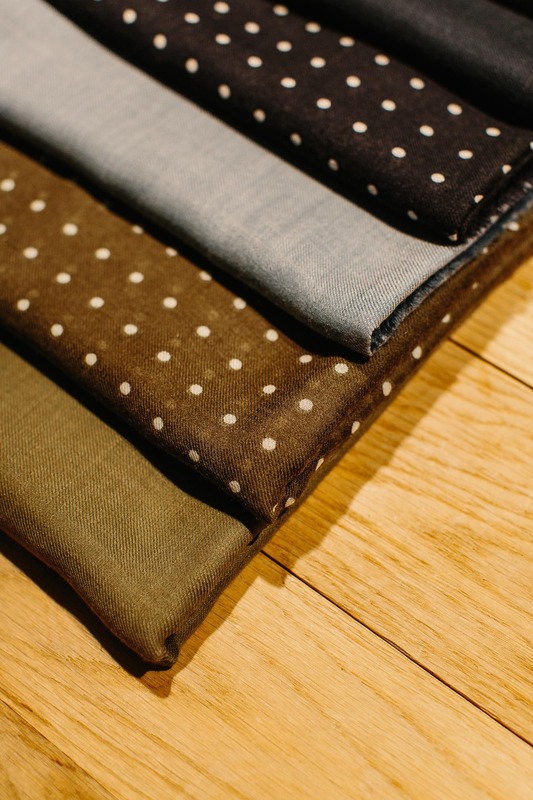 They're available in several styles including a denim, a blue jersey, and a striped cotton. Francesco Marino might be a new name for many readers. 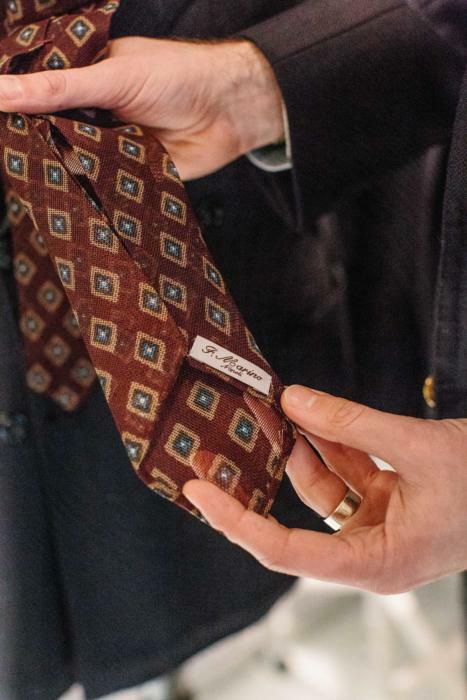 An old Neapolitan tiemaker, they do some very well-finished ties including (in the pop-up) a beautiful seven-fold printed gauze (below, ties £100-£125). Elsewhere, some will want to try the extreme sleeveheads of Sciamat tailoring; there are Marol shirts including their denim dress range; and a range of Lardini tailoring. Finally, nice to have my favourite Norman Vilalta back, with his swept chelsea boots (£1040) and pebble-grain derbys with super-chunky soles. 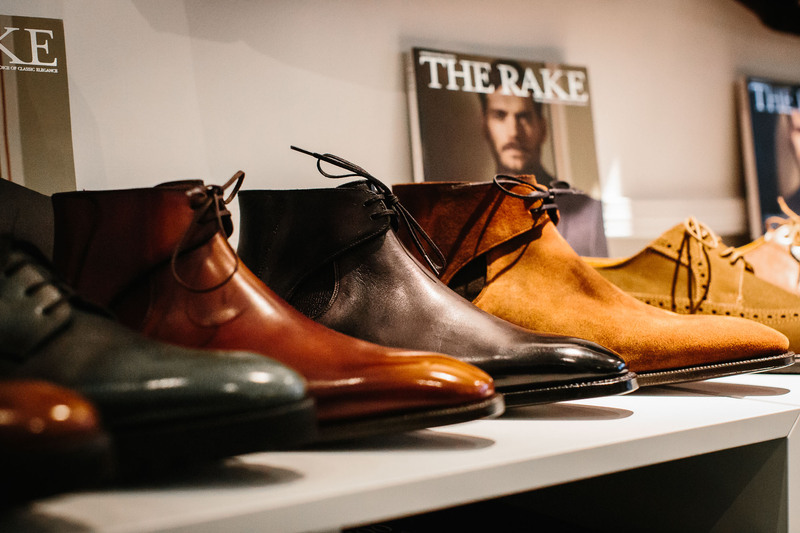 The grey in the middle below is the Rake exclusive - a patina that Wei picked out with Norman. There are details on all the pieces, of course, on the Rake site. In case you want to check them out before visiting the shop. 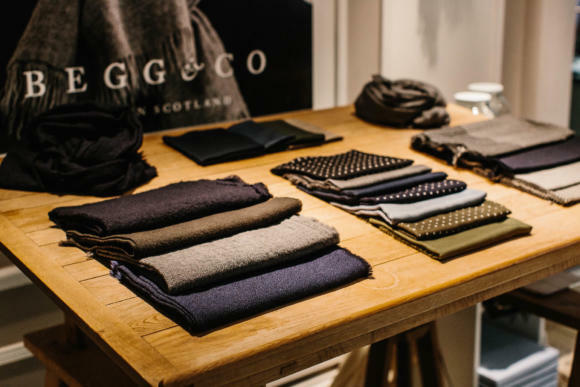 Begg & Co, our third exhibitor in Week 3, will be well-known to readers but remains a wonderful option for Christmas presents. It’s the time of year to wear scarves - and soon the time of year to give them - and even on the first day Begg was selling strongly. The range in the pop-up includes ultra-thin wispy scarves (above, £245), thicker brushed arran models (£260 or £360), and the more casual kishorns (£175 or £280) - all in masculine colours of grey, navy, olive and so on. There is also a small range of the PS squares that we designed with Begg last year, and the brass scarf ring developed with Alice Made This (pictured below). You can follow the discussion on Begg, J. Girdwood and The Rake (Chapal, Sciamat, 100 Hands, Norman Vilalta…) by entering your email address in the box below. You will then receive an email every time a new comment is added. These will also contain a link to a page where you can stop the alerts, and remove all of your related data from the site. Excuse me if you have already answered such questions. I am interested in Chapal and I will be from Tuesday till Thursday in London(5-7.12). Will they be still there available for measurements and orders? Or is it just RTW? Some outstanding pieces, Simon. Bravo! By the way, how do you find Lardini quality/style now that they are being featured in your pop-up? I can certainly vouch for the quality of J Girdwood’s socks. I bought some at the first pop-up and was sufficiently impressed to purchase another couple of pairs this time around. Buy with confidence – they’re great quality items. Would you happen to know what 100hands charge for a bespoke offering and if they have a minimum order? I note their Instagram feed suggests they will be in London at the pop-up between 8th-11th? Hi. Yes sure I’ll confirm prices and details now. 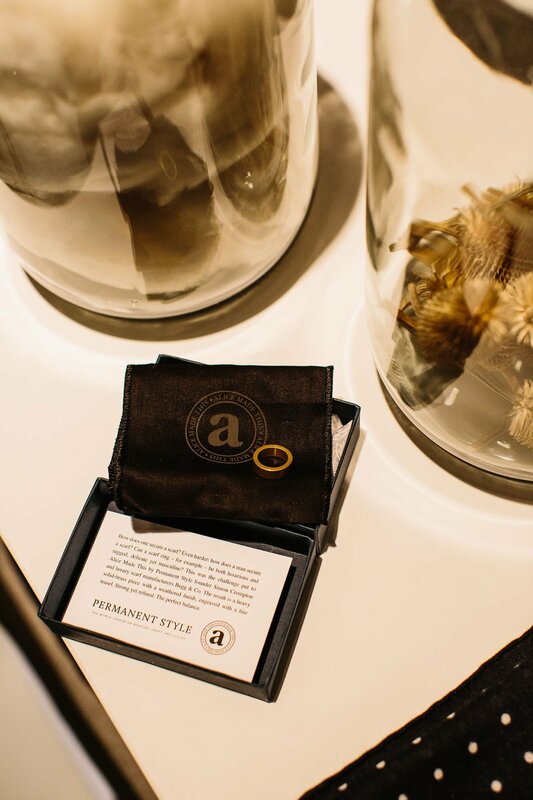 They are doing separate bespoke appointments, but not at the pop-up shop – we don’t have room this time for bespoke artisans. Will the scarf rings be appropriate for the traditional Hermes silk scarves also? How much are they? There will certainly be more style pieces, factory visits, op-ed posts and other lovely PS things in the near future. However these are all brands I would be writing about whether there were a pop-up or not – so not that much different. Out of interest, what particularly would you like to see more of? For me more bespoke projects and outfit combinations – as it was really / before the rapid commercialisation. Even your Instagram feed was hawking something else today. Thanks Matt, good to know. in search of a Christmas gift for my wife I have been looking for ladies clothes, which are appealing yet focus on durability and high-quality materials rather than fashion-forwardness and marketing. Can you recommend any such craftsmen or brands? 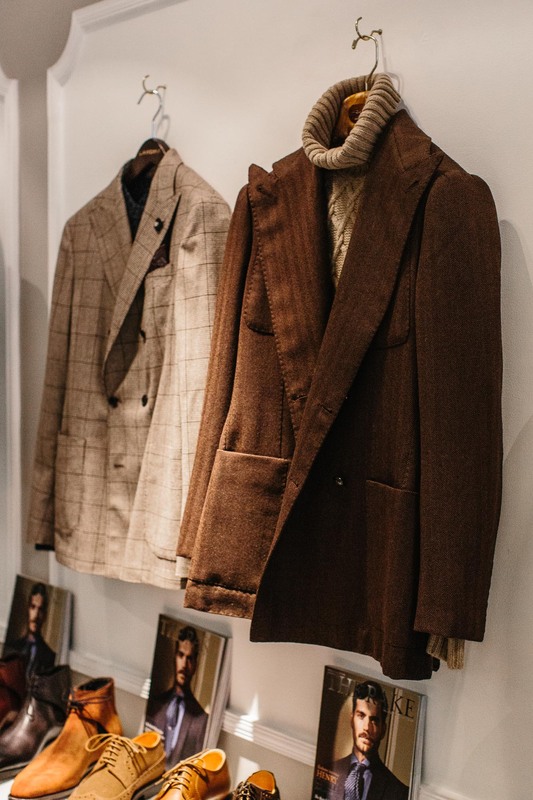 In particular, can you recommend a source for a timeless camel hair ladies coat? No, sorry… Womenswear largely doesn’t work that way, and I certainly don’t know enough about it to know the places it does. Many thanks for your suggestions! Indeed, we decided to give bespoke a go. We will try out Sartoria Sansaro from Rome, which recently started visiting Berlin and tailored a very nice first suit for me. 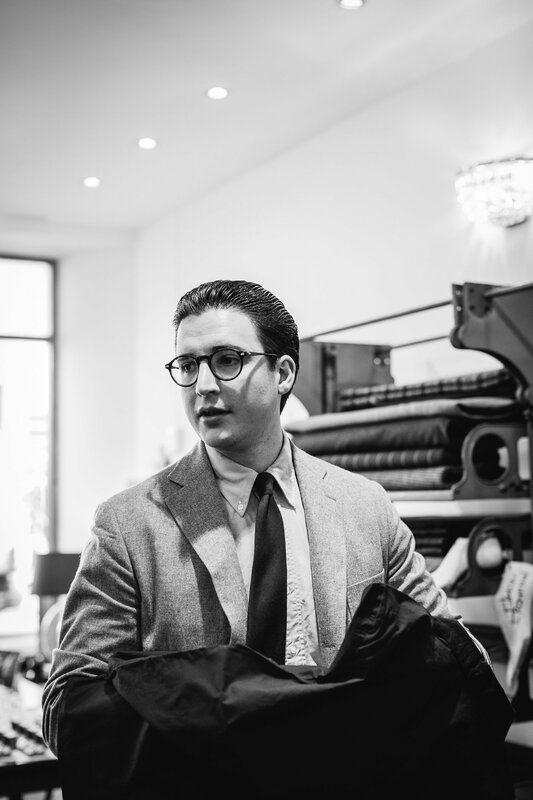 You talk highly of The Real McCoys- do you have experience with their leather jackets? Are they on par with Chapal given they both produce repo A1s and A2s jackets? I know Chapal is a roughly 1K More expensive- would like to hear your thoughts or recommendations. Great to meet you today. Love the green polo, quite possibly my favourite purchase in recent years. Now need to get one in every colour! Best of luck with the pop-up. Now I’ve worn it and on reflection the medium is the right size for me, but it puffs out too much round the back and waist when tucked in. Any recommendations on having it altered, as I feel I could potentially ruin it by getting this wrong, such as getting it darted or having the sides taken in? If you are any amount over 6 feet 3 inches tall (1.85 meters) DO NOT order the Chapal leather bomber. I ordered it from the Rake in XXL and it was not even close to fitting. I’m 6 feet 2 inches (1.85 meters) tall and slim. The sleeves were also way too short. I live in the New York and it cost me a fortune to send it back not to mention I had to pay the duty both ways. Beautiful jacket but sized for elves.